The Great House at Wade’s Green Plantation, Middle Caicos. The fallen Great House at Cheshire Hall. During the American Revolutionary War, not all the colonists fought against Britain, and those who supported the King were called Loyalists, or Tories. After the war and their expulsion, some Loyalists were granted land in other British territories and colonies as compensation for their losses in the Thirteen Colonies. Wade Stubbs, a land owner in America, was one of them. Originally from Cheshire County in England, Wade Stubbs emigrated to Florida, near St. Augustine. After the conclusion of the war and after the 1783 Treaty of Versailles was ratified, he and about 70 other loyalists were granted tracts of land in the Turks and Caicos Islands by the then reigning monarch of Britain, King George III. Nearly all of these grants were on the two largest islands in the archipelago, the centrally located North Caicos and Middle Caicos. Stubbs’s grant consisted of 860 acres on North Caicos, in an area which had probably the best agricultural land in the Turks and Caicos. Here he built a cotton plantation. First christened Bellefield, this site later came to be known as Wade's Green Plantation. The primary crop raised here was long staple Sea Island cotton, and initial yields here and elsewhere in the country were very promising. In 1791 total export from the Turks and Caicos Islands was 260 tons, which accounted for half of the output from the entire Bahamas-Turks and Caicos chain of islands. Citing Wades Green as an example, Stubbs convinced his brother Thomas to start his own plantation, and Cheshire Hall Plantation was constructed on the neighboring island of Providenciales. As with the North Caicos and Middle Caicos plantations, initial production was excellent. However, Thomas Stubbs eventually tired of battling the thin dry soil of the islands and gave up on Cheshire Hall, selling it to his brother in 1810. Over the years Stubbs also acquired the successful Haulover Plantation on Middle Caicos after its founder, Dr. John Lorimer, died in 1807. The settlement of Lorimers on Middle Caicos is named after him. The Great House at Wade’s Green Plantation, North Caicos. Cotton production across the Turks and Caicos began to decline in the late 1790s. The Boll Weevil and other infestations, soil depletion and hurricane destruction made it nearly impossible to make a profit, yet the Stubbs plantations still continued to operate. Sisal, a fibrous agave plant used to make rope and twine, began to be planted in preference to cotton, and again made a decent profit, but the price of hemp from southern Asia and South America was too low to allow the local product to make money. As cotton died out, some of the other Loyalist planters attempted growing sisal, and others began salt production on the sister islands of Grand Turk, South Caicos and Salt Cay, but in the end, nearly all returned to Britain. 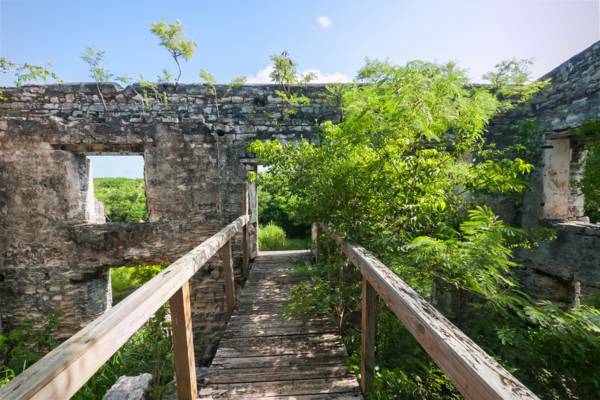 The ruins at Cheshire Hall Plantation on Providenciales. 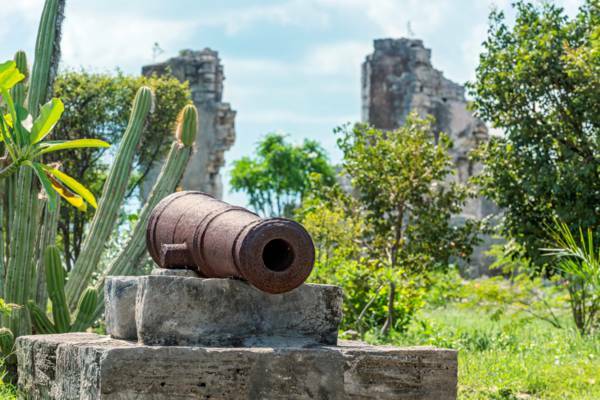 Today, Wade's Green Plantation, Cheshire Hall Plantation and Haulover Plantation are the best preserved and most well-known loyalist ruins in the Turks and Caicos Islands. These plantations all had a similar set of structures: a main house, barracks for the slaves and workers, storage warehouses, a stand-alone kitchen building, wells and stone-walled fields and pastures. Of the three, Wades Green offers the greatest extent of preserved ruins, and archeological research has identified all of the main features of the site. Cheshire Hall has unfortunately been nearly completely taken over by modern development and today only the grounds around the main house and industry buildings remain. 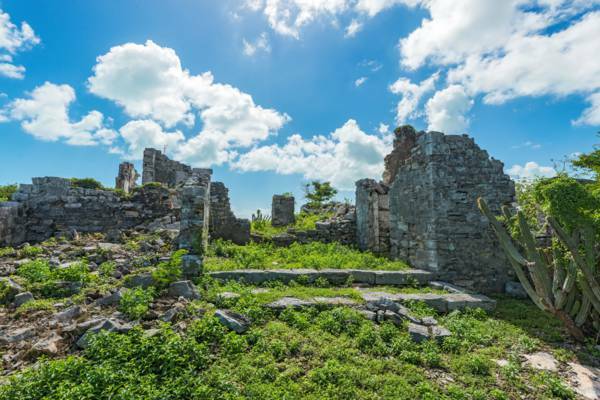 Haulover Plantation with nearly all fields still stands due to its remote location on the sparsely populated Middle Caicos, however, the low dense vegetation common to the Turks and Caicos has taken over, hiding all but the chimneys of the kitchens. Wade Stubbs was the most successful plantation owner in Turks and Caicos history and had a great impact on the developing country. At his death in 1822, his holdings included over 8000 acres across the Caicos Islands and 384 slaves. Many of his former slaves adapted the Stubbs surname, and today it’s one of the common local family names.